This year marks the first time the preschool, which opened last fall, has operated a summer camp at its Union Ave. campus. The preschool now joins the larger Harker community’s long-running tradition of offering programs after the regular school year ends. Summer camp at Harker Preschool is held in two sessions, each designed to engage and excite young children through familiar summer themes. The program is staffed by year-round Harker teachers, assistant teachers and aides. Students are grouped by age, with families choosing one or both sessions to match their summer schedules. Session one ran from June 23-July 18 with 55 enthusiastic beach campers filling the preschool’s sunny cottages, play yards and specialty classrooms (STEM, music and movement, and art.) Session two began on July 21 and will run until Aug. 8 with the theme “Little Cabin in the Woods.” For the second session, children will be grabbing their backpacks and heading off to the (imaginary) forest. Highlights of the first session included water fun on “Splash Days,” as well as explorations of both sand and water. At one point the youngsters made their letter of the week “S” in honor of the word sand. They also had a great time using sand sensory tables (playing kinetically with both sand and seashells), comparing the texture of starfish to that of sandpaper and creating sand dollars. Campers also learned about erosion and how sand is formed when rocks are rubbed together. Four-year-old preschool camper Luca Chan, who also attends Harker Preschool during the regular school year, especially enjoyed the many ocean-themed books introduced and discussed during group times. Fellow student Miley Liu, also 4, said she liked “making a beach in a box,” an activity in which students filled plastic containers with sand, shells and other items you would see at a beach. “And we get to take them home!” she said. In art class the children enjoyed activities including sea foam watercolor painting, sand sculpture, sea life printmaking, lobster claw still life and shell weaving. “Along with observing and drafting whale shark characteristics with oil pastels, artists were invited to create collages with seaweed, shells, and images of sea life. We also discussed where pearls come from and what they look like at a pearl bead making table,” recalled art instructor Alexandria Kerekez. 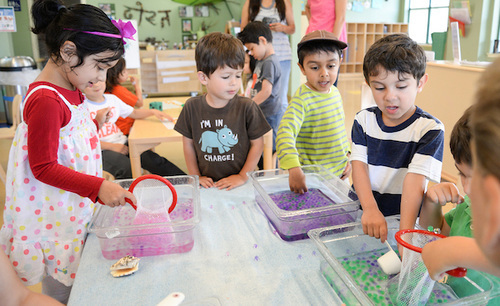 The first summer session was filled with surf, sand and sun as the children “soaked in” all there was to see and do around this well-loved ocean/beach theme, explained Andrea Hart, director of Harker Preschool. “Young children really love to learn by doing; together we explored sea life and play through sand and water, singing silly songs and reading stories about friends who live and play on the salty shore. All were inspired by our new pet hermit crab and overflowed with questions about ocean life. There were some excellent sandcastles made, sometimes even from sand the children made themselves by manually grinding rocks!” she enthused. Now, with session two under way, the children are trekking into the imaginary woods to discover all the wonders of life in the great outdoors. “They’ll meet new forest animal friends, build with logs, dig in the dirt, pitch tents, create with found objects, explore common outdoorsy tools and enjoy everything nature has to offer. All the fun of a camping adventure without the worries of bears or mosquito bites!” said Hart.